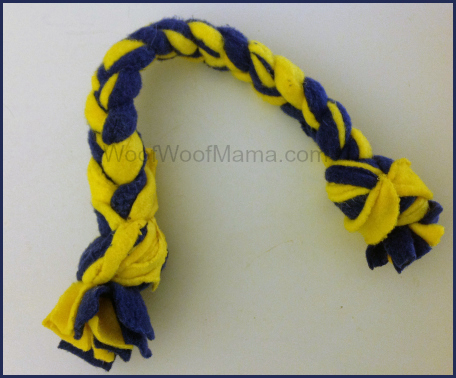 DIY Pet Project: Make Your Own Fetch and Tug Dog Toy! 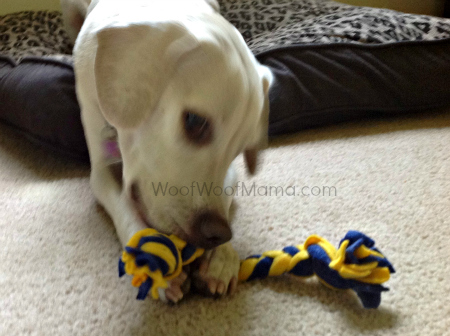 Here’s a fun and easy DIY Pet Toy project you can do with your kids or grandkids! I got the idea from Modern Dog Magazine and emailed Daisy’s Grandma with the link since she is always on the lookout for fun craft ideas to do with my niece (who I call “Little-A”) when they hang out together. 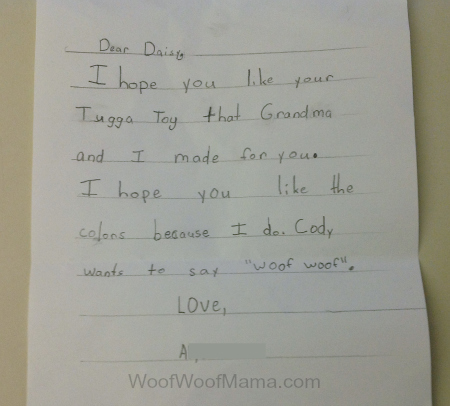 Less than a week later, look what arrived in the mail addressed to Daisy, with the SWEETEST note from Little-A herself! While the original project used old t-shirts, my mom took the concept a step further and used inexpensive fleece fabric strips in Maize & Blue (University of Michigan team colors) for Daisy’s toy, and also made one for Daisy’s cousin Cody! I think the fleece material will be more durable than t-shirts but you can use any old fabric you’d like to recycle (blankets, jeans, sweatpants, etc.) or watch for sales on holiday-themed fabrics and make some to stash away for stocking stuffers! You basically just twist or braid strips of fabric and knot it all together at the ends. Playing Fetch and Tug with your dog can be a fun way to teach or practice skills and obedience commands including Sit, Give, Wait, Drop It and more. Check out these Tips on Teaching Your Dog Tug from the ASPCA Virtual Pet Behaviorist for info and advice! You can view the original DIY Dog Toy instructions here. As you can see, Daisy loves hers! Thanks Grandma and “Little-A”!